In this post, we’re talking about something that I am super passionate about which is reading and precisely how to read books in about 20% of the time without learning how to speed read. If you take 10 books multiplied by 5 hours, that’s 50 hours of reading. That’s a REALLY long time. So I'm going to you how to cut that down by 80% and read ten books in under 10 hours. The goal of reading books is to get the knowledge – to get the value out of the content in the pages. There is nothing inherently noble about reading a book from front to back. That might make you feel accomplished, but at it at the end of the day you want to invest the least amount of time to get the most information. Also, we need to agree on is the fact that reading is essential. If your mission in life to make more money, build more wealth, and have more freedom, then reading and obtaining knowledge is paramount. There’s a reason guys like Warren Buffett and Bill Gates read for hours every day. Warren Buffett reads about 5 hours a day, and I've committed to reading about 2 or 3 hours a day. This strategy that I'm going to show you is for reading material that you want to learn and retain the knowledge. This reading technique isn’t for fiction books. You don’t want to read a Harry Potter book in a few minutes. You want to sit back and enjoy that. This is reading to acquire knowledge. Do I have to be a genius to read 10 books a week in under 10 hours? In high school, I was either an A or an F student. I either breezed through a class or I failed miserably. In the 10th grade, I was interested in psychology because I just started my first business. So I decided I needed to learn about psychology. I went into a psychology class and borrowed a psychology book and used it for a week. I was so interested in the subject that I read the entire book in a week! A lot of my other classes suffered because that book got 100% of my attention, but the reason I was able to get through the material so fast was because I had a motivation for learning. I had a motivation for really wanting to understand psychology, so I was able to get rid of the other distractions and focus on my mission. By the time that I took the class in 12th grade, I had moved on. I was interested in other subjects, so I got an F in the class even though I knew the information inside-out. The lesson of that story is, you need a real desire to learn the material. You can’t just learn out of obligation. If you're really into the subjects that you're reading, it’s going to make this process easy. The first step is all about learning the main theme of the book. This takes about 10-20 minutes maximum. Learning the main theme is exactly what it sounds like. Every book has a theme. It might be a self-help book about confidence. It might be a technical book about how to do something like how to trade Bitcoin. As you guys saw in the last Pathways to Wealth interview, Lewis Howes stopped by to discuss his New York Times bestselling book, “The School Of Greatness“. I'm going to use his book as an example. So, Step 1 is to go to Amazon.com and read the table of contents, the description of the book, and the most helpful reviews. That’ll give you an overview and a little bit of insight into the book's main theme. Click here to view The School of Greatness on Amazon. After you’ve read the description and the table of contents, you're going to read the reviews. For Lewis's book, you'll notice it gets over 90% 5 stars. I like to read the most helpful reviews. People will write a summary of the book and what they got out of the book. This is really helpful, because you’ll get the main theme from their review. By that time, you should know the title and the subtitle of the book. You should know the title of all of the chapters and maybe read a page or two to get a feel for how the book reads and then also read the reviews to see – A: Is it a good book and B: Understand the summary from a reader’s perspective. Next I do a YouTube and Google search for either the author’s name or the title of the book. I'm looking for interviews and summaries that people wrote on a blog post or podcast interviews. For this example, you can go back and Lewis’s interview with me where he talks about the books main theme. If I'm watching a video interview or book summary, I'll play the video at 1.5 to 2x speed. 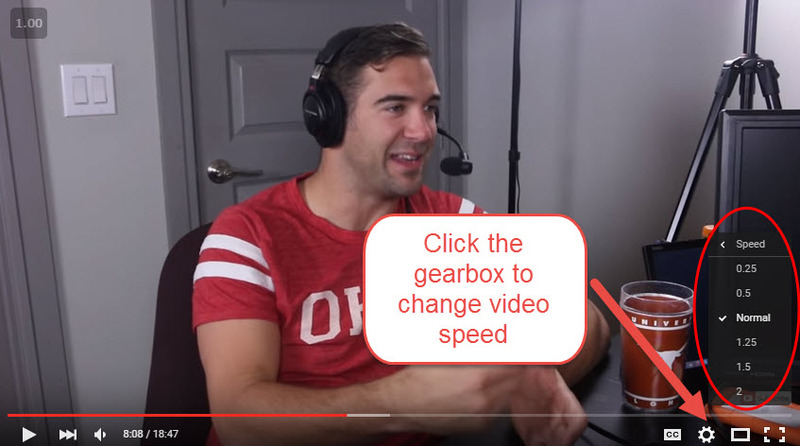 For other videos, I've downloaded the Video Speed Controller extension for Chrome. Step one should only take 10-20 minutes to get an understanding the main theme of the book. After you understand the main theme of the book, decide if it's you want to learn more from the book. About half of the time I’ll finish Step 1 and feel like I don’t need to dive more into the book. 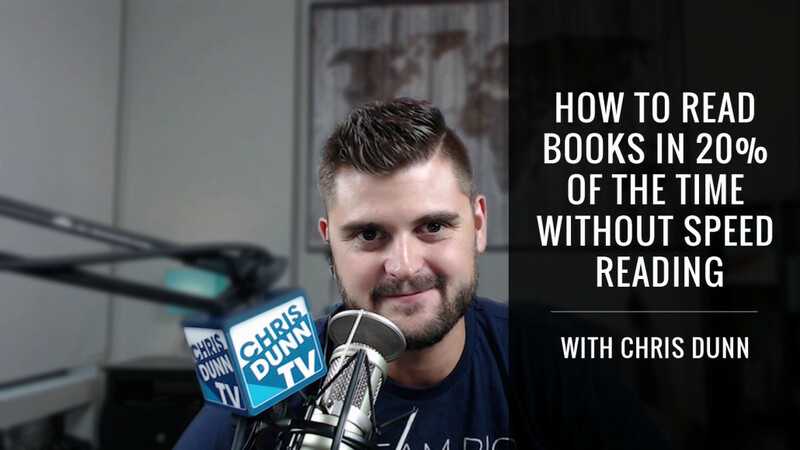 A lot of authors will have an idea that’s only good for one chapter or one blog post, but because they want to make money, they'll put stories and filler content to create a book. But the reality is, about half of the books I read really shouldn’t be full books – They should just be an article or a blog post. So, what is the “Quick Scan”? First, buy the book on Kindle or two-day Amazon Prime shipment, unless you want to drive to the bookstore. I'm a big fan of Kindle because you can sync up your reading locations. I read a lot on my iPhone, and you can also read on the Google Chrome extension. Kindle also saves the popular highlights. If there’s a line or a chapter or a sentence in a book that’s popular, Kindle will put that in a particular section where you can read the top 1% or 2% of that book immediately. Right away, you're getting the best stuff in just a few minutes. I’ll quickly flip through any read the first page or so of each chapter. I’ll also read all of the subheadlines, quotes, lists, exercises, and anything that pops out on the page. Some books are easier than others, which is why I think The School of Greatness is a great example because he has lists, chapter summaries, and exercises. You should be able to do the quick scan in 10-15 minutes. I stop at this step with about 25% to 50% of the books that I buy, because after doing the quick scan I've gotten all the information that I need. Again, your goal is not to get brownie points for reading an entire book. It’s to get the information that you can use and apply in your life. This is where most people start when they think of “reading a book”. It’s where you dive deep, and you read chapters and paragraphs. And we're not wasting time doing deep dives on books that don't deserve our time. I only read about 20% of my Deep Dive books in the traditional sense, from front to back. Most of the time I'll start by reading the most interesting chapters first. This not only helps keep me engaged but allows me to pull the most important information from a book FIRST. Also, sometimes I'll download the audio book from audible.com to keep me moving through the book quickly. I’ll play the audio at 2 or 3 times. That dramatically increases retention because you only remember a certain of percentage of what you read, a certain percentage of what you see, a certain percentage of what you hear. Combining reading and hearing doubles your retention. I recommend getting a free trial of Audible.com to see if you like listening to books. Some people love it, and others don't like the distraction. Either way, it's worth testing for yourself. Another trick that I use to read books quickly is to skip the stories. A lot of authors will write a few pages of “meaty content,” then back up their idea with a few stories. I think stories are good. People learn through stories, so If you want to dive in and digest everything, read all the stories. But if you just want the meat, then skip the stories and move onto the next part. Don’t feel guilty if you hop around, skip a chapter, or decide to quit reading the book. Again, the goal is not front to back reading every single book on the planet – It’s to get as much information as you can to help you achieve your goals. Sometimes I’ll read a few chapters, then put the book down when I feel like I've gotten the most out of the book with the least amount of time possible. I want to show you five actionable steps for how to save 80% of your time. Step 1 – Go out and find 10 books that interest you. You could look at the New York Times bestseller list, go on Amazon.com. Pick a category, look at the top 10 or 20 books and then pick out 10. Then, research the main theme for all of them at the same time. Block out an hour or two to go through and research 10 books and find out which ones interest you. Step 2 – Choose 3-5 out of those 10 books for a quick scan. After you’ve done the theme research, you'll know the high-level point of the book, the reviews. You've seen summaries and maybe some video interviews for all of those books. You’ll know more than most people just by doing that first step of doing the theme research. And then out of those 10, the 3-5 that you buy, to do a quick scan—again, buy them all at the same time. You don’t have to read them all at the same time or keep reading after you do your theme research, but take 15-20 minutes to do your quick scan. Step 3 – choose 1-3 books on average for a deep dive. Block out about 90 minutes to do a Deep Dive on a book. This will keep you motivated to read quickly and extract the information and not just fall asleep or get lazy and start daydreaming about something else. The old way if we have 10 books—let’s say you bought 10 books and you invested reading those books slowly all the same pace for 5 hours on average each, that’s 50 hours. That’s over a full working week to read 10 books. But our new ways is to take 10 books times an average of 15 minutes for learning the main theme. That’s about 2-1/2 hours to learn the main theme of 10 great books that you’ve handpicked. The quick scan of about 5 books will take about 15 minutes as well, about a little over an hour. And then, out of, let’s say, the 1-3 let’s go on the high end. Let’s say you pick 3 out of those 10 that you decide are worth the investment of your time to do a deep dive. Invest on average about 90 minutes on the final step. At the end of 10 books, you should have invested about 8-10 hours to extract the most valuable information from 10 books. Don’t just listen to this and say “Oh that sounds great”, then move on with your day. I would highly recommend starting with The School of Greatness. It’s a great motivating book and an easy read.